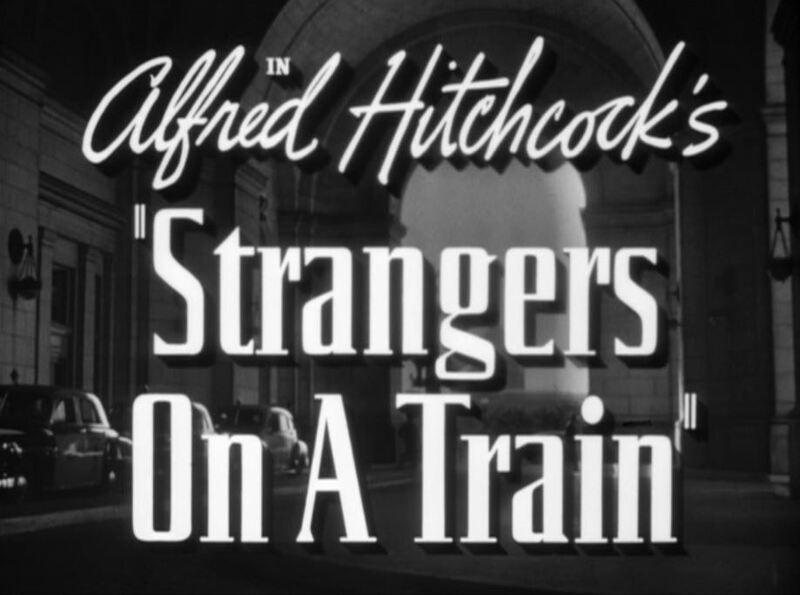 Not as famous a train movie as Hitchcock’s magnificent, North by Northwest, Strangers on a Train still manages a respectable amount of railroad action and decor in its 101 minutes. 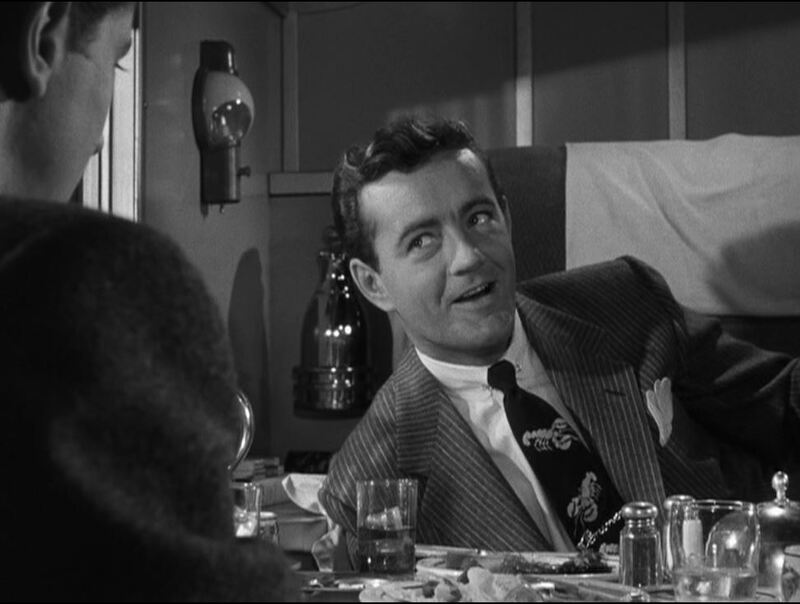 Robert Walker steals the show with his wonderfully-creepy portrayal of Bruno Anthony, the off-his-rocker rich kid. 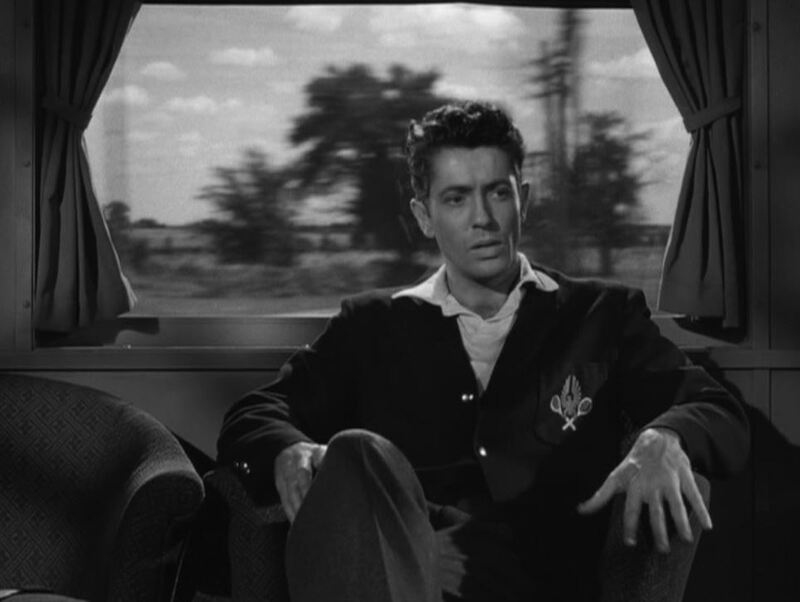 Farley Granger plays Bruno’s foil, Guy Haines, the tennis star who can’t quite believe what is happening to him. 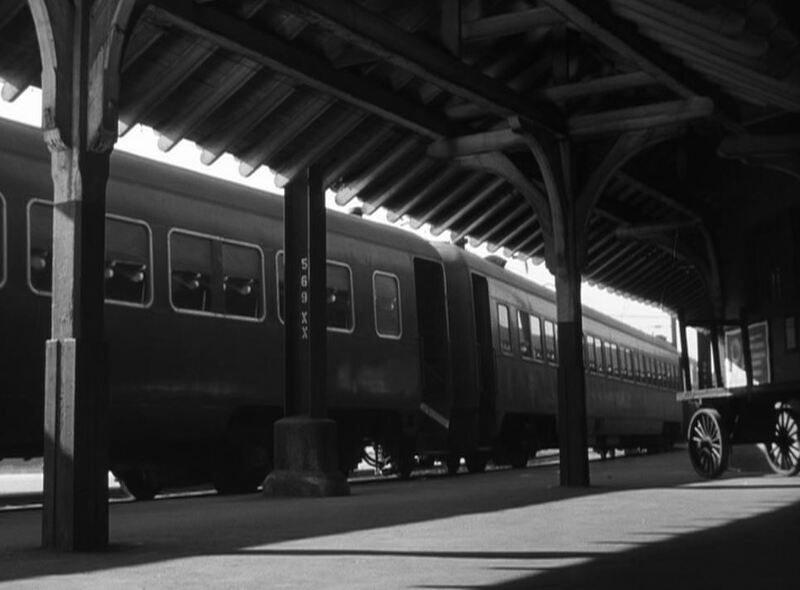 Trains are an integral part of the film, not only at the fateful first meeting, but as a bridge between scenes. 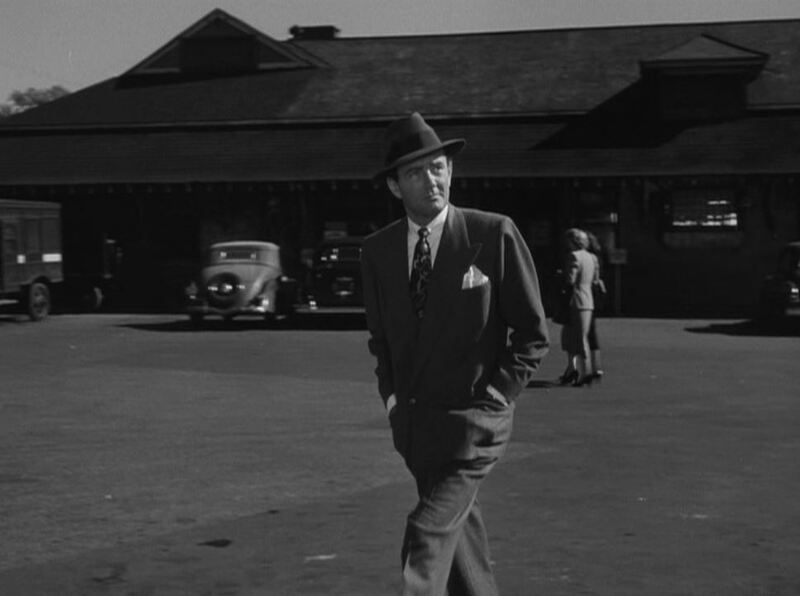 Quoting from Imdb Trivia, “The train station scenes in Metcalf were filmed at the former New Haven Railroad station, Danbury, Connecticut, which is today the home of the Danbury Railroad Museum“. 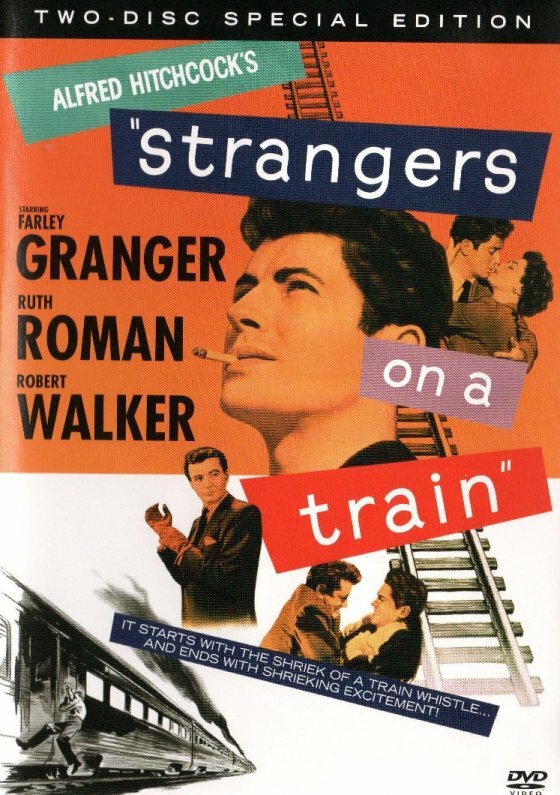 Let’s ride to danger on the New Haven with Guy and Bruno! 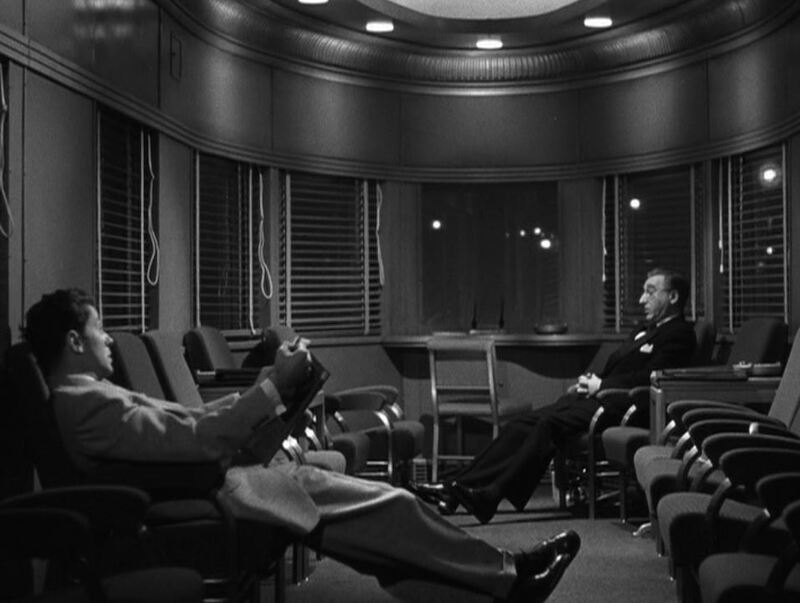 It’s probably just a set, but wow, what a lounge car! 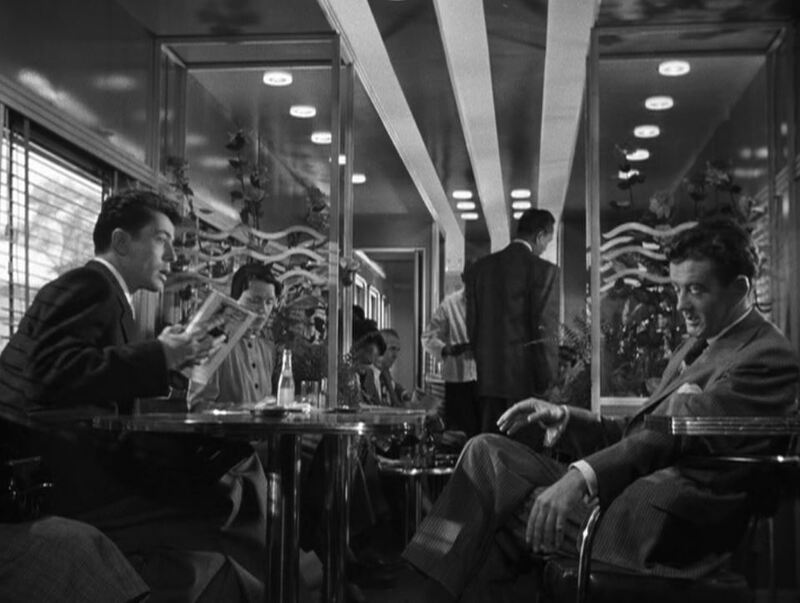 Chrome and glass and spot lighting highlight the first encounter of Guy and Bruno riding the train. 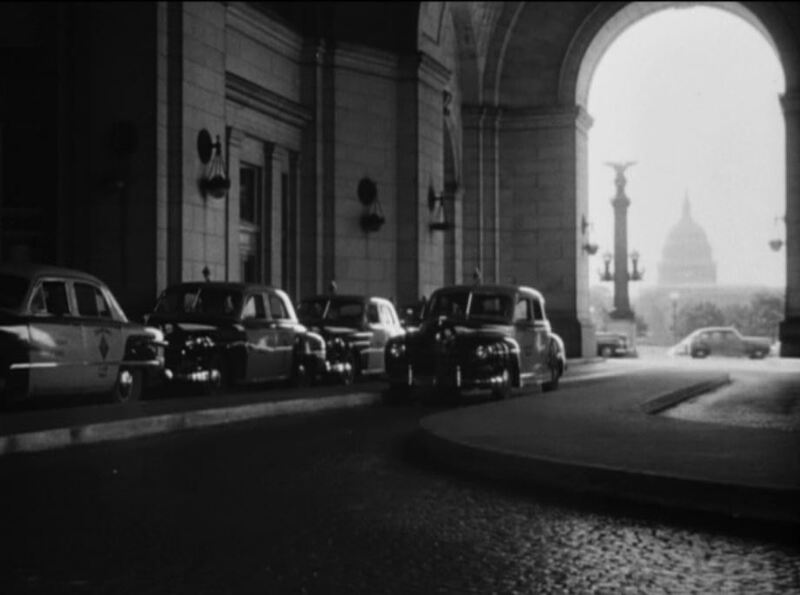 The film opens in the archway of Washington DC Union Station (note the U.S. Capitol in the background). 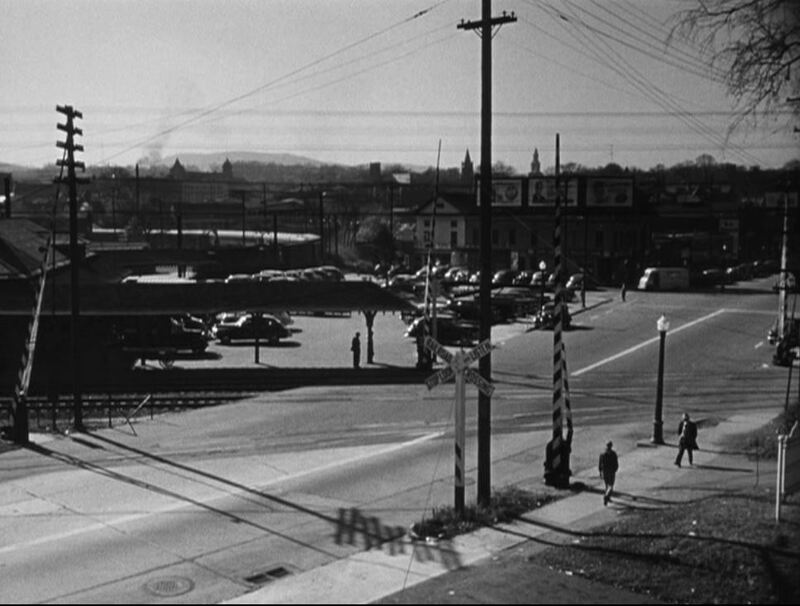 Separate taxis (1948-49 Plymouths….Thanks, Mark!) 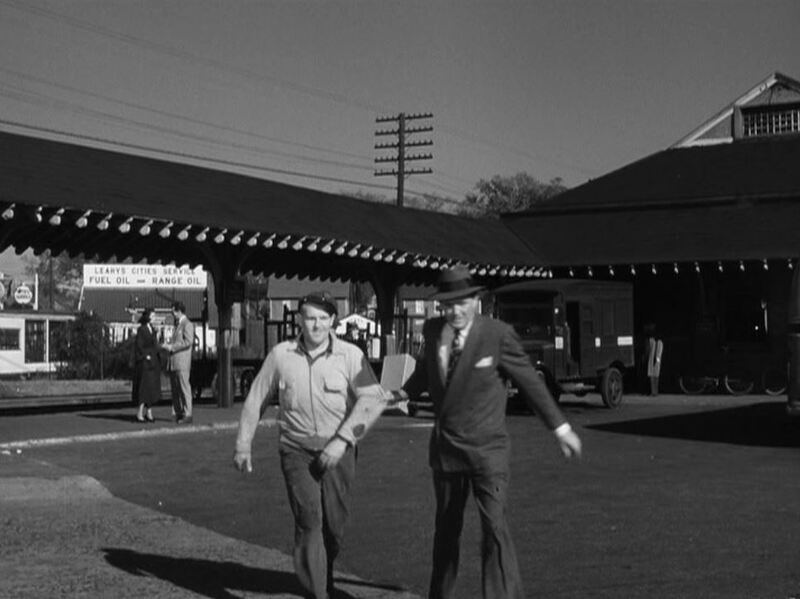 bear Bruno and Guy into the terminal and through the gate to trackside. 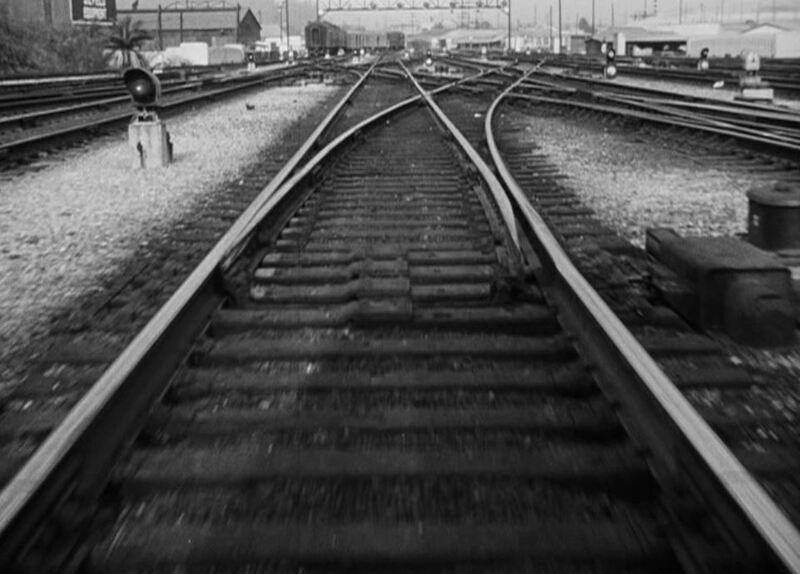 The train pulls out through a maze of track…with palm trees in the distance (must be Southern California somewhere). 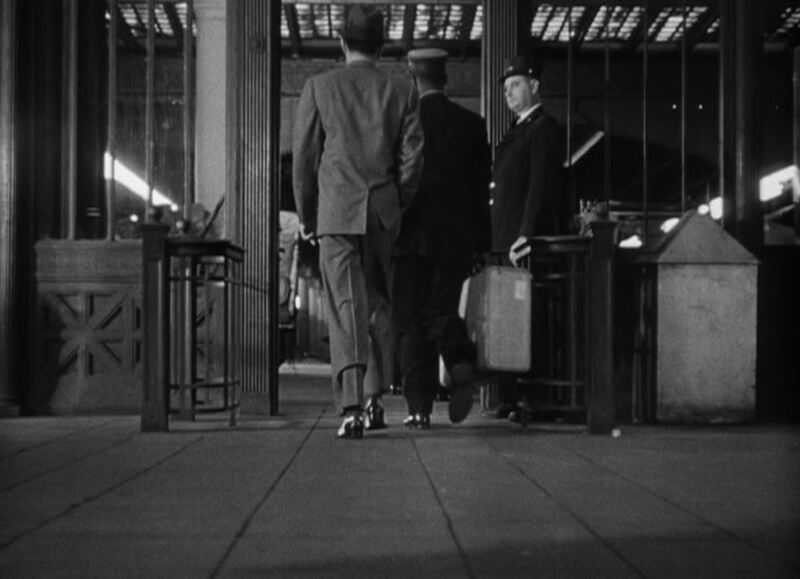 I LOVE those two-toned shoes Robert Walker is wearing. Such a dandy! 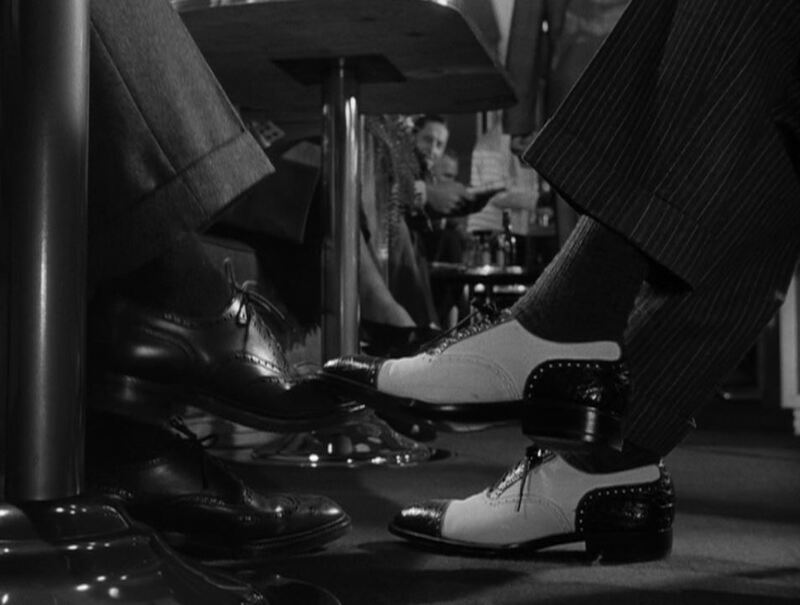 After accidentally playing footsie, Bruno moves right in on Guy. 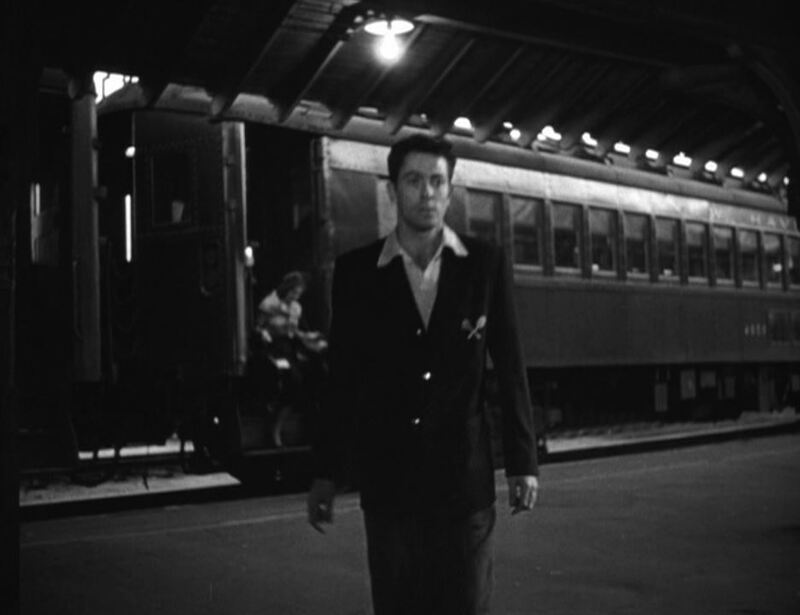 Lots of film noir touches such as window blinds shadowing Bruno’s face like prison cell bars. Bruno’s name clip and lobster tie further emphasize his kookiness. 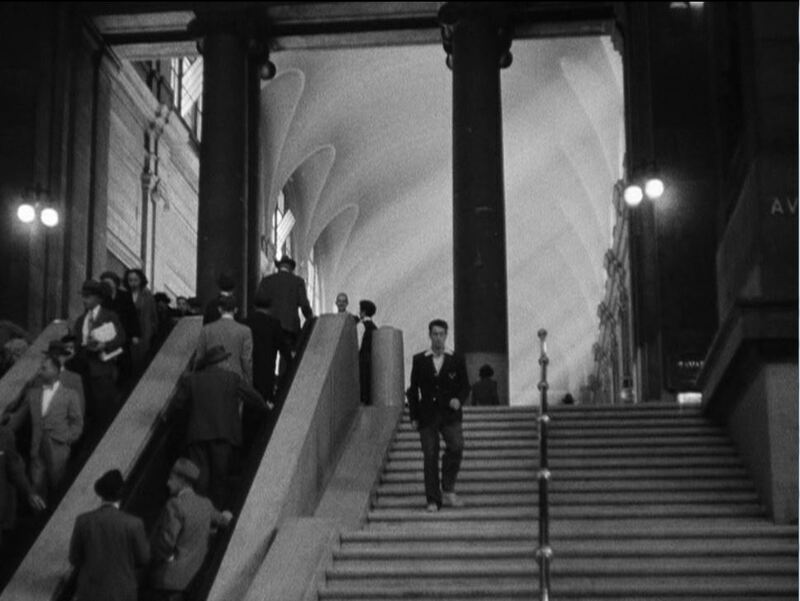 Bruno even manages to talk Guy into coming back to his bedroom for some supper. 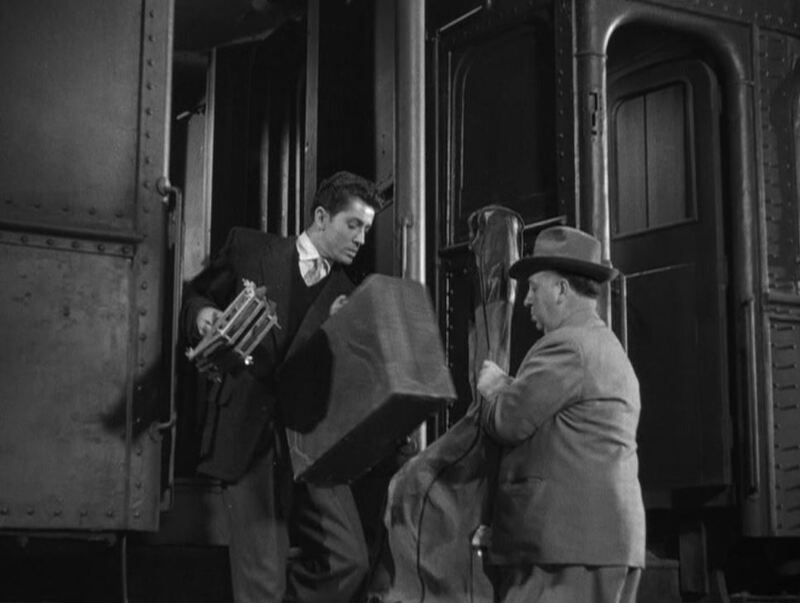 Look at all that railroad china and silver! 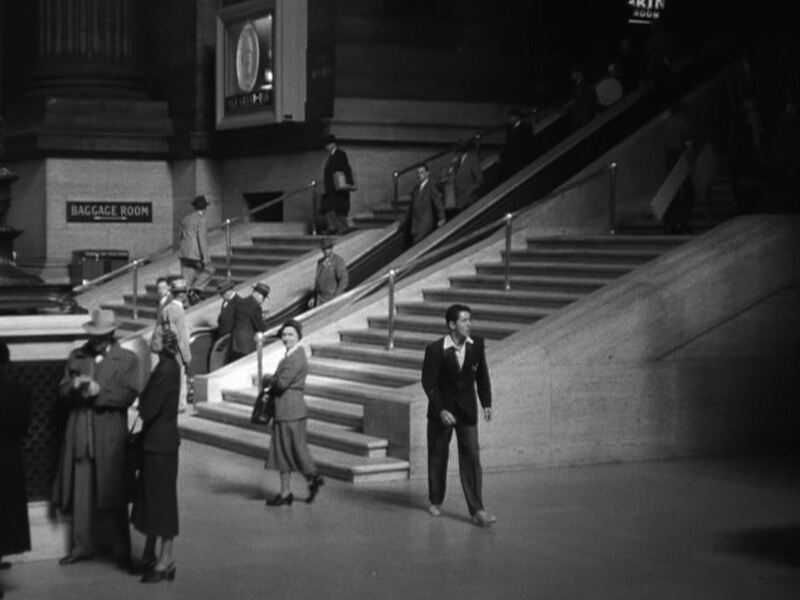 Arriving at Metcalf, we get our first look at the circa 1934 New Haven Osgood Bradley “American Flyer” coaches with NYNH&H logo clearly visible. Hey, who’s that chubby dude with the stand up bass? 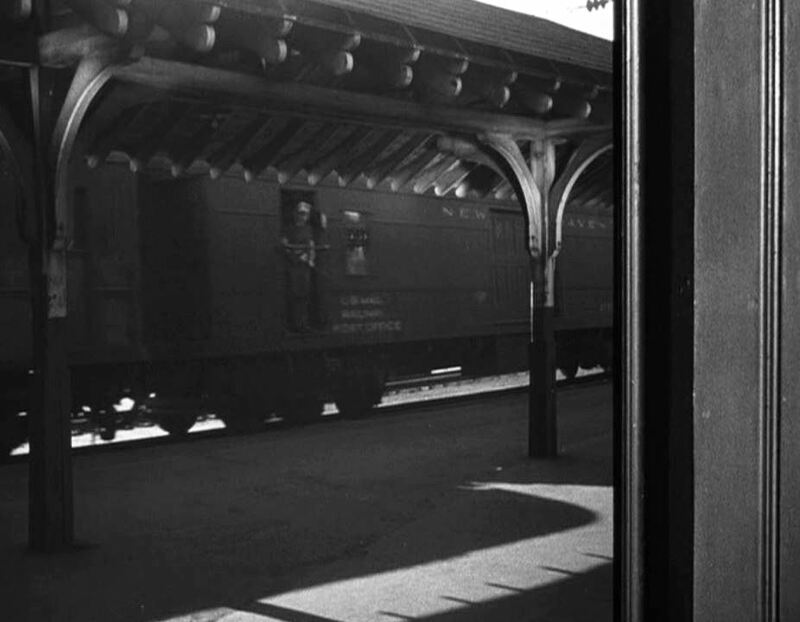 As Guy strolls into town, take a look at all that railroad-related paraphernalia in the 1951 edition of Danbury, Connecticut. 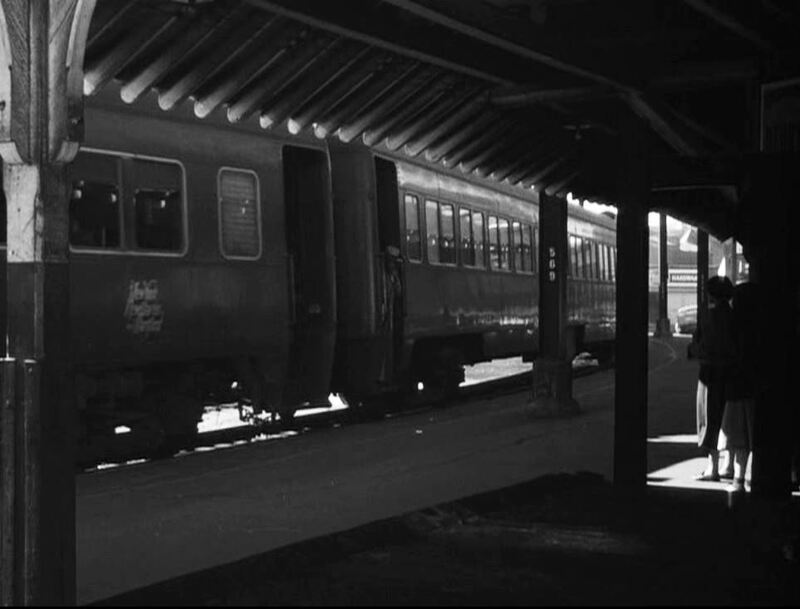 Lots of train detail in another scene. 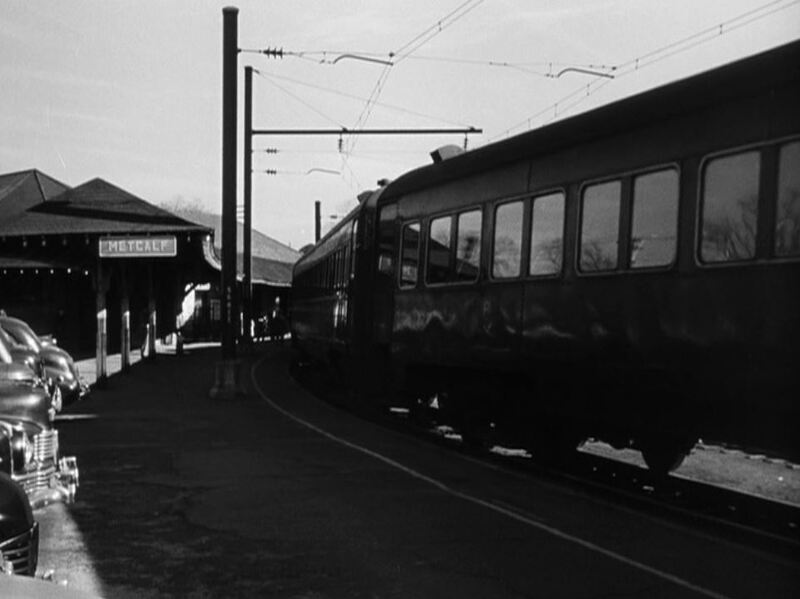 We just catch a glimpse of an Alco RS-2 diesel locomotive pulling a train complete with Railway Post Office and another string of American Flyer coaches. 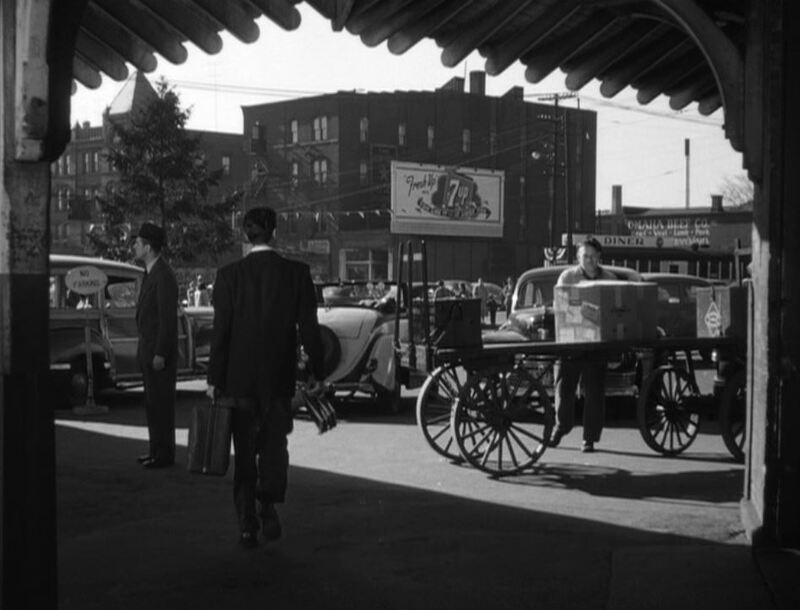 Note the METCALF sign on the depot. 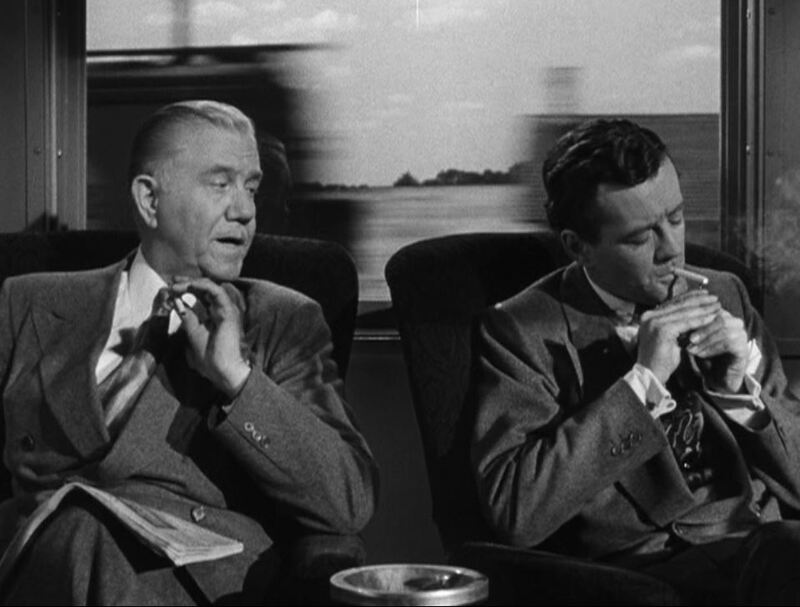 In separate train rides, Guy encounters a quite-sloshed professor type in the observation car whilst Bruno is asked for a light. 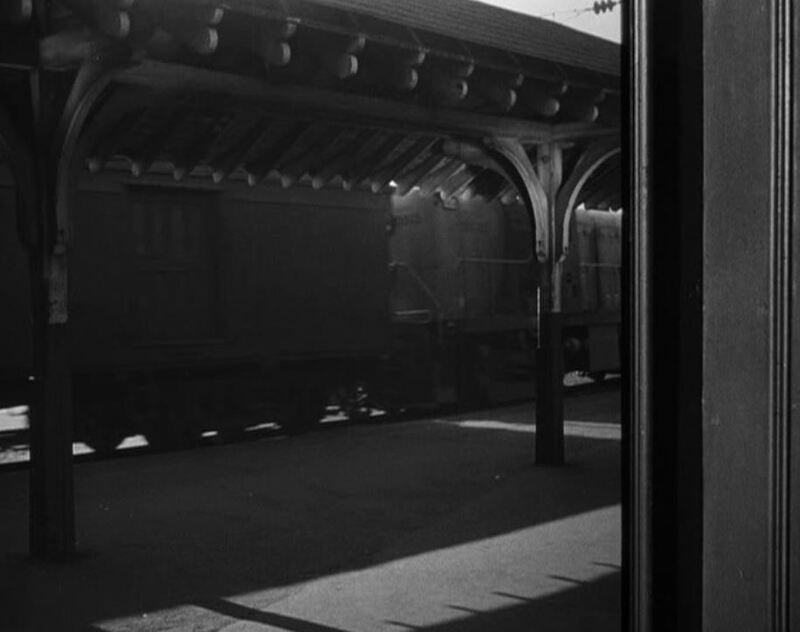 Bruno de-training at Metcalf (to plant evidence and frame Guy), gives us still more detail shots from different angles of the Danbury station. 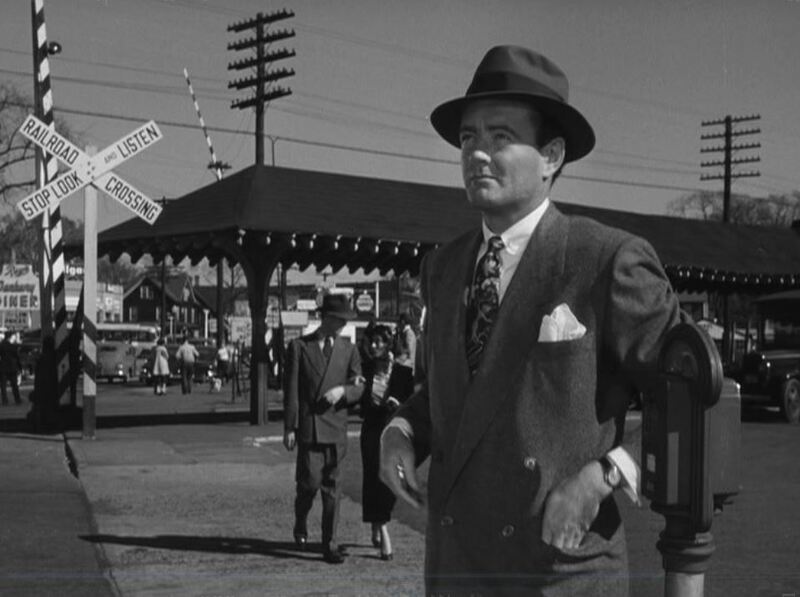 Aren’t those crossing gates cool? 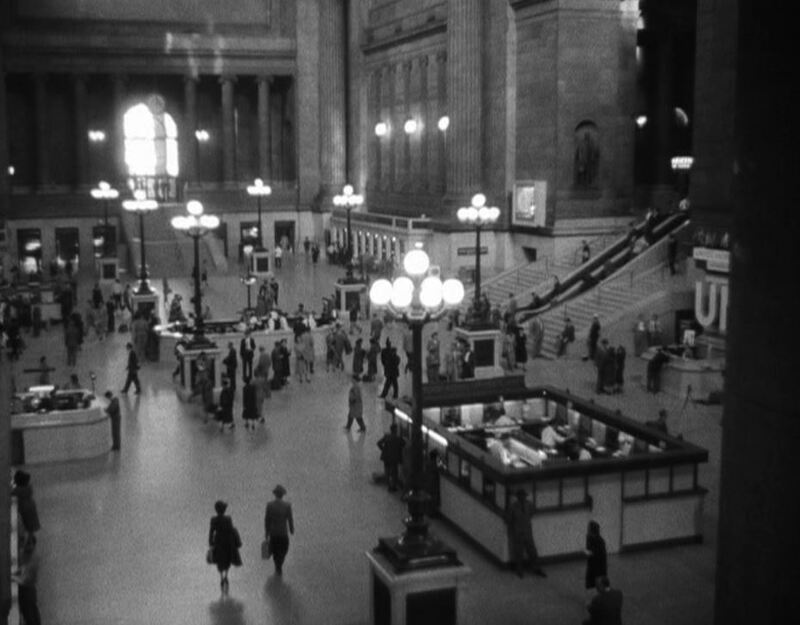 Meanwhile, Guy is passing through New York’s old Pennsylvania Station (note advertisement of Pennsy EMD E7 units in the last picture). 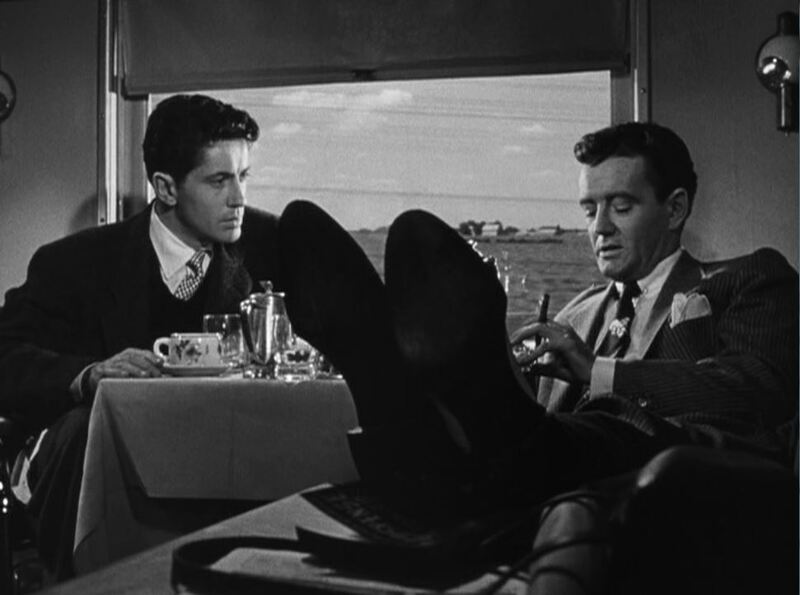 Riding in a lounge car, a troubled Guy gets off at Metcalf to confront Bruno in the final showdown. 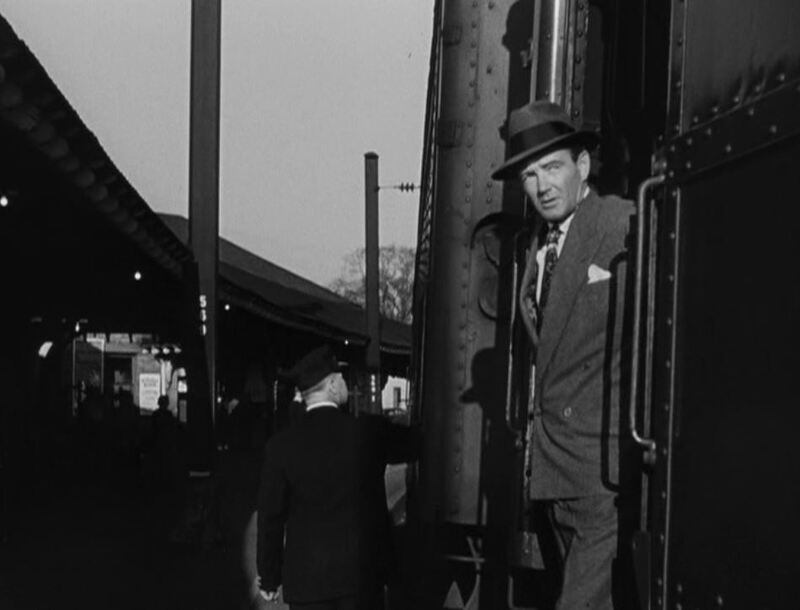 This entry was posted in Uncategorized and tagged Alco RS-2 diesel, Alfred Hitchcock, American Flyer, Connecticut, Danbury, Danbury Railroad Museum, E7 diesel locomotive, Farley Granger, Film Noir, Metcalf, New Haven Railroad, New York, New York New Haven and Hartford Railroad, North by Northwest, Osgood Bradley, Pennsylvania Station, Robert Walker, Strangers on a Train 1951, Union Station, Warner Brothers, Washington DC. Bookmark the permalink. 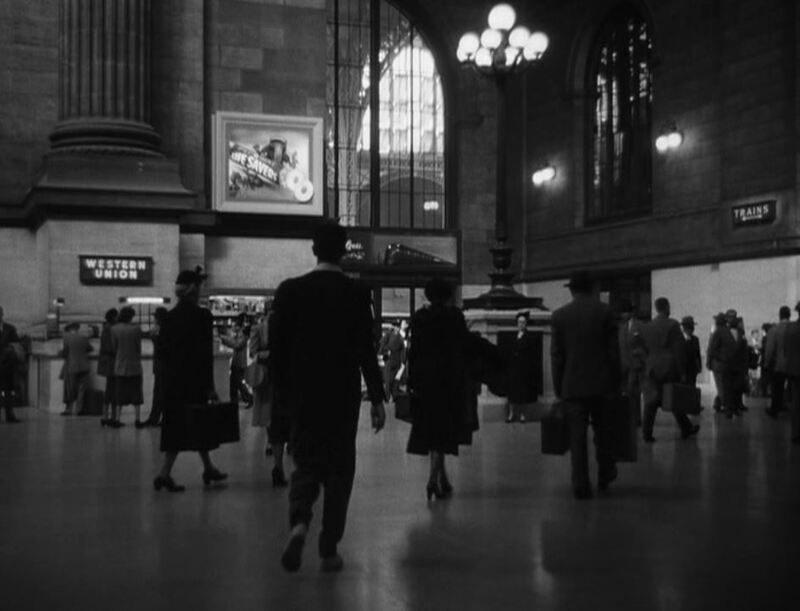 Don’t forget that other Hitchcock masterpiece that takes place on a train, The Lady Vanishes! Great site by the way, very informative.